Assistive technology products and services can create a whole new world of opportunity and independence for individuals with physical disabilities. 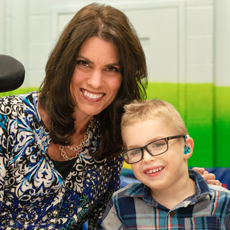 Assistive Technology Solutions (ATS) at the Easterseals Rehabilitation Center is a regional leader in assistive and complex rehabilitation technology, empowering people with disabilities with greater control over their lives. A team of rehabilitation engineers and technologists, occupational therapists, and speech therapists provide evaluations, demonstrations, and training on a variety of assistive devices. Assistive Technology Solutions (ATS) aids individuals in accessing funding sources and obtaining the equipment they need to live more independently. For additional information, visit the links below, call 812-492-0659, email scheduler@evansvillerehab.com, or contact us online . For many adults with disabilities, driving an automobile is a major step toward independence. Assistive Technology Solutions enables many individuals to achieve that goal. We can also assist experienced drivers who experience changes due to accident, illness, or aging. Seating in a comfortable, supported position is critical to individuals who spend their waking hours in a wheelchair. The Easterseals Rehabilitation Center utilizes a variety of techniques to provide maximum seating comfort and function, and to match the seating with the appropriate wheeled base to meet each individual's unique needs. The highly specialized field of Rehabilitation Engineering can open new worlds of independence for individuals with disabilities at home, at school, and in the workplace.